Learn how to defeat the Lady Butterfly boss fight in Sekrio: Shadows Die Twice and any potential cheese methods, tips, or strategies to use. 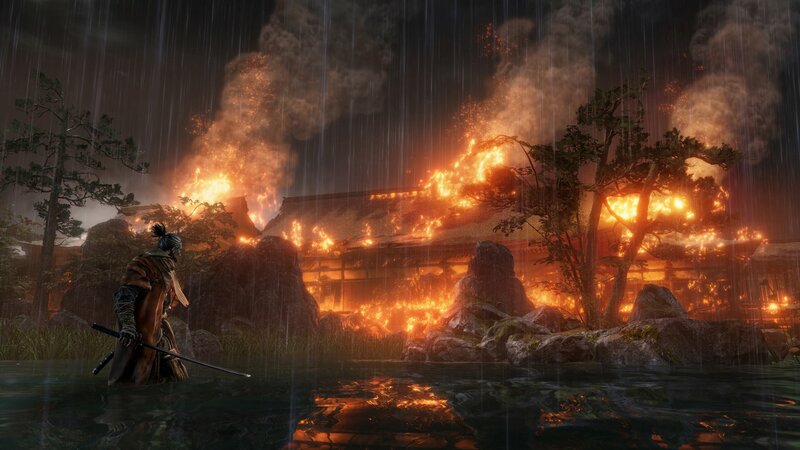 The Lady Butterfly boss fight in Sekiro: Shadows Die Twice is hard. For a lot of players, Lady Butterfly might be their first major boss fight. Regardless of whether you’re fighting her first or after defeating other bosses, we’ve got some tips on how to make this fight easier. Defeating Lady Butterfly is going to be challenging, especially if you try to beat her before taking down Gyoubu Oniwa. Firstly, if you’re fighting Lady Butterfly before defeating Gyoubu Oniwa, stop. It is far easier to go and defeat Gyoubu Oniwa and then return to the Lady Butterfly fight later. The reason for this is that Gyoubu is far easier and he will increase your attack power, allowing you to deal more damage. Another advantage of going elsewhere before fighting Lady Butterfly is that you should be able to comfortably collect enough prayer beads to create two prayer necklaces. In fact, depending how far you go past Gyoubu Oniwa, you could find enough gourd seeds for 5 or 8 charges of your healing gourd. This is all going to make the Lady Butterfly fight significantly easier. You will have increased damage, more vitality, and far more posture. Plus, the experience of fighting elsewhere will help you practice deflecting. As for the actual boss fight with Lady Butterfly, she’s quite easy to read but exceptionally punishing if you make a mistake. The fight also has a second, hidden phase. After you deathblow her once, she will disappear and then add more moves to her repertoire. The key to the Lady Butterfly fight is whittling down her vitality and then focusing on her posture. Personally, I used the Whirlwind Slash as it deals damage even if Lady Butterfly is guarding. In the second phase, I used the Flame Vent prosthetic tool to score some free vitality damage on her when she lands. A good option can be to use Loaded Shuriken, as it can knock her down from her thread and interrupt her attacks. Consider the first phase of the Lady Butterfly fight the hardest. The reason for this is that you will want to conserve as many healing gourds for the second phase as well as a resurrect. However, if you happen to blow through a lot of resources, don’t worry as it’s still possible to defeat Lady Butterfly. For the majority of this fight, you will want to bait her into standing on her threads. Lady Butterfly is easy to read when she’s in the air. Two knife throw: This attack has her throw out two knifes, then two more, and then dive down toward you. To avoid taking damage, deflect the knife attacks and then guard against her flurry. This can be followed up with a counterattack. Danger jump and pin: When standing on her thread, she will leap into the air and try to pin you. As she telegraphs this move, roll to the left to avoid it. Rolling right will get you caught. Once she lands on the ground, attack her while she’s recovering. Two jumps and kick: This move has Lady Butterfly jump from one thread to the next and then follow up with a kicking move. This one is not telegraphed with the “danger” kanji, so you will need to watch her closely. Either step back or guard her attack and then counterattack. Danger ground spin: When Lady Butterfly is on the ground and the danger symbol appears, jump. This signals she is going to do a sweeping spin attack. If you manage to jump and kick her, you will deal considerable posture damage. The majority of phase 2 is going to be about running and dealing chip damage where possible. Whenever Lady Butterfly summons her ghosts, just run circles around the room. They will eventually turn into butterflies and shoot at you. Running around the room makes the butterflies miss you entirely, avoiding the need for Snap Seeds. It's also worth noting that all of her attacks and combos from the first phase will return with some new ones during this phase. Phase 2 Start: This phase begins with Lady Butterfly dropping down from above to a set point in the arena. If you can stand near this point, you can overwhelm her with a lot of attacks, dealing considerable vitality damage before she summons her apparitions. Ghosts and butterflies: Start running laps around the room when Lady Butterfly summons her ghosts. Keep an eye on where she is, as you will want to rush her as soon as all the magic butterflies finish trying to attack you. Long flurry attack: This attack begins with the boss summing a few butterflies around her. She will then launch into a frenzied attack that finishes with a sweeping danger move. Guard or deflect the main burst and then jump over her sweep attack at the end. Aside from the main attacks listed above, Lady Butterfly also attacks with standard hits, jabs, and knife-throws. You will need to learn which ones precipitate a combo and which ones you can simply guard through. 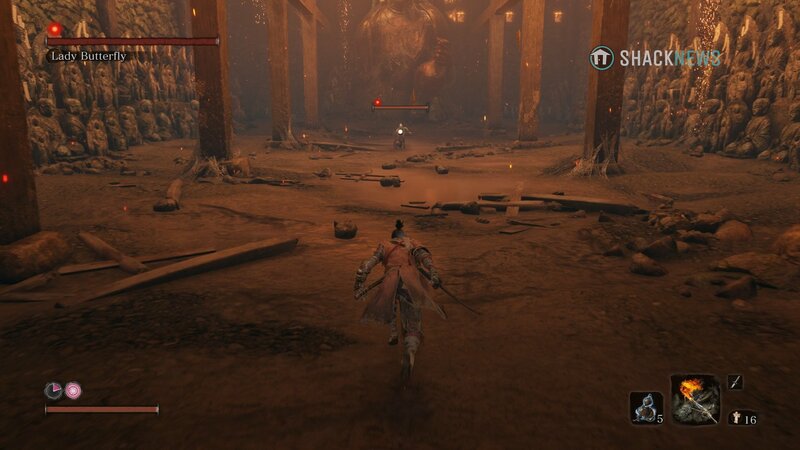 So long as you’ve spent the time collecting the prayer beads, gourd seeds, and increasing your attack power, the Lady Butterfly boss fight in Sekiro: Shadows Die Twice should be much easier than when you first attempted it. With this fight cleared, you should be in a good position to fight Genichiro Ashina.